Dave, I'm not sure how much agreement or fervid opposition you will receive, but thank you for your timely editorial. It is time for everyone to examine just why we decided to go to Baghdad in the first place. Patriotism and Christianity are not good answers. Dave would you please post that 8th. grade promotion has been moved to 2:30 to allow support for the Knights in the first ever sectional Championship game. My thanks to all those that realize ALL of your Childs activities are important. PS Fieldcrest has never won a sectional game until now. I just wanted tell everyone that Matt Kalkwarf is back in the States. He arrived in St Louis this morning at 8.30 am. We are all glad to have him back safe and sound. I also want to thank everyone that sent him a birthday card when he was in Kuwait. He received over 50 cards. THANKS THANKS THANKS. I have not heard from any of the Minonk Scout Troops as yet and wondered if you had had any interest from any of them as to making contact with our troop ?. Editor's comment: How about it local Boy Scouts? Anyone want to contact the Scouts in England? 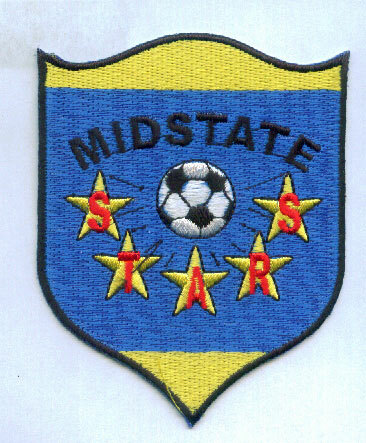 The MidState Stars Soccer Club are selling their team patches for $5.00 a piece. Please contact any MidState Stars Soccer Club member. You can also contact Mike Zimmerman ( 309-432-3057 (H); 309-527-1515 (W) ). Click here to see patch. The Fieldcrest Community Baccalaureate Service is this Sunday, May 20, at 3:00 pm, at the High School Gym. Everyone in the various Fieldcrest communities is invited to join this year's graduates and their families for a time of worship and prayer. This year's service is organized by the Minonk Ministerial Association and several of its pastors will lead the service. The Rev. Dr. Daniel A. Gansch-Boythe will preach the homily. Where would you find "12 oz. packages - escalloped apples" for this recipe??? I can't seem to find anything like this. I also attended the concert on Sunday and was very impressed. The ending was the beat with the Tribute to the various military people in the crowd and to those that were not with us. My sister, Donita was present and got to see her picture up there representing the Air Force, she was in from Germany for the week. My hat is off to those wonderful performers and everyone else that helped make that concert a show stopper. Great Job at State, Fieldcrest Scholastic Bowl Team!!! Congratulations to Coach Nancy Reiter and the Fieldcrest Middle School Scholastic Bowl team!! They faced two extremely tough teams in their pool at Class AA State competition. Those teams went on to win the championship and consolation matches by huge margins. Our kids won their third match by defeating a good Quincy team, whose junior high has 1006 seventh and eighth grade students. The Fieldcrest team is a great bunch of kids who have supported each other throughout the season. Coach Reiter has made this such a positive experience for our son and our family. Many thanks to Nancy and her husband Bill for their many tireless hours and encouragement they've given all the kids. We also appreciate the support given to the team by Mr. Roberts, Dianne Tarmann, Jill Werkman, the parents and fans. Thanks also go to Mr. Roberts, Mrs. Peterson and her band, and the students, teachers, and staff of Fieldcrest Middle School and East Elementary for their wonderful send-off to State. We're looking forward to more great experiences with Fieldcrest Scholastic Bowl teams! Maybe if we could get some spring activities out there, like for instance...spring soccer leagues, we do have a field, just sitting out there. Maybe by keeping it busy with kids and adults so we won't have as much of a problem. We could start up some kind of neighborhood watch. We have the parks connected to where if someone would arrange different times people go for their morning, afternoon and evening walks would be a good way to keep all the parks busy with people exercising and helping in keeping their community safe. This is a nice, small community and I would be glad to help by walking through the parks and not only try to improve my health but to also help improve the behavior of a few kids that need to be taught how to respect others property. If you see something being done, call them on it. If it continues or they become disrespectful, report it. To make it better we must be consistent. I think it is a small enough problem that if we stay consistent we can fix this. I was told that Promotion has been changed back to 1:00 due to a large volume of negative feedback. We would not want to delay any parties a hour and a half to allow all events to be attended! schneider@btsnetworks.net , hope to see everyone on July 14th. Just wanted to let everyone know that Minonk VBS will be at St Patrick's Catholic church July 30th - August 3rd from 6-8:30pm. The closing program will be on Sunday August 5th. This year's curriculum will be Avalanche Ranch - "A Wild Ride Through God's Word" from Group. We ask that you please pre-register your children (ages 3 - 5th grade) so there are enough t-shirts for everyone!! We also need all of the volunteers we can get (there are usually 200+ kids)!! I have this year's music Cd's available for early purchase for $10 each. There will be a VBS volunteer meeting at St Paul's on June 5th 6:30-7pm please join us. If anyone needs a registration form or would like to volunteer please contact me at 309-303-6769. A donation of $10 per child is GREATLY appreciated (to help with the all of the cost for VBS)!! I look forward to yet another great year at Bible School!! I Shary Jenkins think that you should fix the platform of Ella Martin's gravestone because if all the people put just 50 cents and that gravestone is that tall and was nice at that time, if everyone just put 1.00 it could be fixed and looking nice. Please just think about it because all the pain that Ella Martin was put through it would be really nice to get the grave fixed. Dave, I believe that is the flower of an Aesculus Hippocastanum, or common name, Horsechestnut. 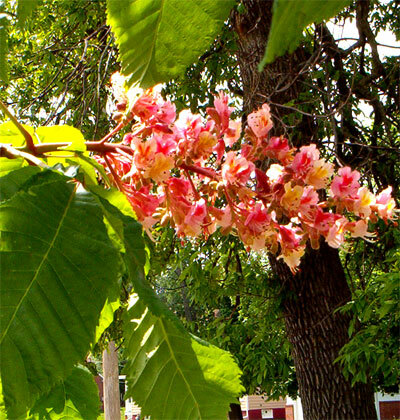 Attached is a picture of Aesculus x Carnea / ‘Briotii' or Red Horsechestnut, that is planted in my front yard at Maple and 7th. Wow! God is the awesome creator !! Editor's reply: Mike. You're right. It is a horse chestnut tree flower shown on the front webpage. I planted a row of them at the northeast corner of the Minonk Township Cemetery 8 years ago for those of you who want to see one of the prettiest tree flowers ever. In response to Pam Goy's question about " escalloped apples" You can use " Stouffer's Harvest Apples ". Or if you prefer you can make your own. Mix apples, flour, lemon juice, sugar and cinnamon. Place in a buttered oven-proof casserole. Dot with butter. Cover with foil and bake in a preheated 350 degree oven for 30 minutes. I would like to take a few moments to thank everyone that supported me in the election. I would also like to thank the members of the city council for making me feel so welcome at the meeting last night. Most of all I would like to thank Jason Buchanan for the time that he worked on the council and the dedication that he had. I am looking forward to the next 4 years getting involved more with the community and taking a active role. I welcome phone calls from people in my ward that have issues, or if you see me up town and have a question please feel free to stop me and ask. I will try to get a response to you in a timely matter. I will not act like I know everything due to the fact that I am new to this but I will work hard and try to do the city justice. I would also like to congratulate Sean Cunningham and Corey Ruestman for retaining there seats as Aldermen. Robert Renkin from Bloomington formerly of Minonk drove out and got the ferret this morning. He emailed me after seeing the story on www.minonktalk.com. I am happy the friendly ferret has a good owner that really wants it. Robert says his parents live right down the street from me. Thanks for the ferret connection Dave.